Well the second trip up north definitely did me in and I got laryngitis for the first time in my life. For a couple of days last week I couldn’t speak above a whisper and I felt pretty much like crap until the following Tuesday. I did manage to meet my daughter Kyrston and her boyfriend Jeremy for dinner one night. They drove 1-1/2 hours and I drove an hour and we met in Vermont. Thankfully the weather cooperated and we had a very nice time although I had to whisper my way through the dinner. Jeremy was pretty sweet about it and it was wonderful seeing Kyrston since we hadn’t been together since we left in November. When I got home on Friday I was a wreck, so I slept most of Saturday and stayed in the camper on Sunday as well. Dr. Jo came up to see us one last time before we leave Tampa and brought Peyton and Annubis with her. It was sad because although I know I will see her down the road I don’t know when. But it was so sweet that she drove the four hours round-trip to see us and hopefully we’ll see her and Ben sooner rather than later. So nothing exciting this weekend at all to share in the picture department, but I do have February’s budget finished. Groceries under budget…hooray!! Thank you Walmart Neighborhood market! Dining out we went over by $82, but we knew that would happen this month and we did much better at communicating on this category so I still count this as a win. Entertainment we were under by $106 which cancels out the overage in dining, but I would like to track those as separate categories and try to stay under in both. We were under in truck fuel and used no relocation fuel which was great. We will see what happens in this category when we start moving again next week. RV and Truck Insurance was high because we switched to a full-timers plan and had to prepay on one and were paying in arrears in another. One time blip. We will be paying $160 rather than $90 going forward though, but totally worth it for the piece of mind by having the right kind of coverage for our lifestyle. Next month I will adjust the budget on this once I get a clean monthly bill. Ok… Home Improvement…went over by another $372. Obviously we need to get this category under serious control. It’s hard to complain though when Lee is doing such cool customization to the rig…but yes we have discussed it in detail. Clothing we went over by $72 and that was all me and the new shoes I bought. I’ll take the hit on that one. Personal care went over by $72. This is another category we will need to adjust because obviously $50 is not going to get it done for us, even going to Super Cuts. So overall we did ok, especially for as much activity that we packed in with our friends. In March my daughter Kat and her boyfriend are coming to stay for a week, so that should be interesting, but they are chipping in on groceries which should help. I signed us up for the Escapees Rose Bowl Parade HOP. It’s been a bucket list item of mine since I was a teenager and the all-inclusive week will cost us $1680. The includes tickets to everything, transportation, campground for 7 days, and one meal a day. So I took $840 out of savings as a deposit and consider that our “vacation” this year. We also had to buy a portable water tank and a macerator pump since we are staying for a week at a campground with no full hookups. This was on our original purchase list, but we didn’t buy it before we left. Thankfully, we got an unexpected refund check on our house insurance for $500 which covered the costs. How awesome is that!! My advice here is you will be tempted to wait and buy some bigger ticket items once you are out on the road. In some cases that may make sense as you won’t have enough information about what to buy until you try out the lifestyle, but I absolutely recommend a separate savings account for those items so they don’t come out of your contingency funds. 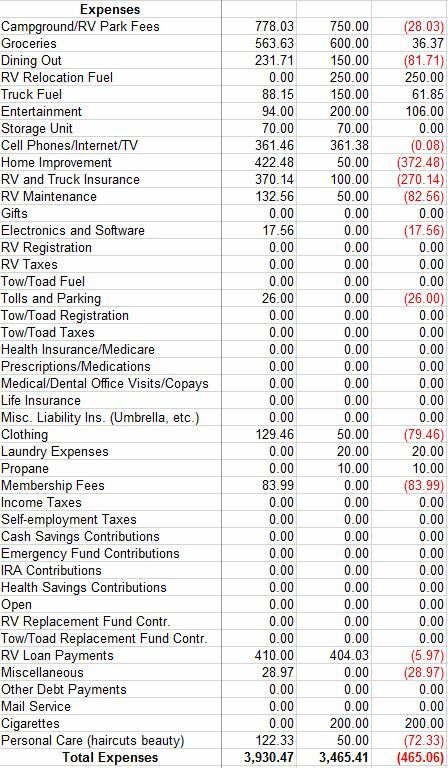 I also wanted to pass along that Jim and Barb of Jim and Barb’s RV Adventure just hit their one year mark and shared their annual expenses here. To prove the point that everyone’s budget and experiences are very different, they have traveled for a year with an average campground costs of $5 (they boon dock a lot). They also spent $7,400 for the year in fuel because they traveled quite a bit last year. I am so glad they shared the information so I could drive home the point that literally Your Mileage May Vary…. Plus they have a darn good blog :). So that was my week. This week is all work, and getting ready to move on to Apopka. Then things start to really get interesting as we see how moving around and my working gel…plus first time with a kid staying with us. Should be interesting and lead to some new firsts!!! Thanks for sharing info about budgeting! We take off in our teardrop on April 1 (full-time) and the budgeting experience is pretty much a shot in the dark right now regarding variable expenses! We did get Howard’s spreadsheet, although due to some issues with excel on our laptop, I haven’t been able to use it. Thank you, again! The spreadsheet is a little tricky at first. I had to email him a coup,e of questions to understand it…but once I got it going it worked great. It all sounds good Trace (except the getting sick part). I think you guys will enjoy moving and the new scenery and experiences it brings (ya, challenges too- some good, some not). Congrats to Lee finishing Tech School (soon?) and have a safe trip moving north! You are right about each budget being different, it is amazing that although many live the same lifestyle they can be actually quite different. If Lee would stop getting his weekly waxings I think the Personal Care category would go down dramatically! Thanks so much for the budget. We have yet to sit down and figure that out! We were so excited to take off after Guy retired that we haven’t even thought about it. I sure hope you feel better, plane traveling is not for the faint of heart. We are finally relaxing here in Tucson, staying in one spot for the past week has helped us relax. Sunday we head to Santa Fe for a week. Have you had your check cashed from Ocean Waves? I’m glad you finally get to start moving and seeing a little more of the surrounding area. Give Lee a big hug and tell him Congratulations!! Thank you for posting your expenses, including the various categories. A few of them, I wouldn’t have thought of. An accurate budget is one thing I’ll need to tackle myself. I used to get that every year – Bill would say – “yay!” He is so bad! Great job on the budget – we are also working on getting/keeping ours under control – not so easy as I HATE budgets – but they are necessary!